The Simpson Chubby range is the height of shaving luxury; choose from the Chubby 1, 2 or 3 in Best or Super badger hair. Most Simpson and Vulfix shaving brush handles are lathe turned by hand, then polished before being filled with a 'knot' of the finest quality badger hair. To create each 'knot' the skilled craftsmen at Simpson first grade the hairs, then weigh them before tying it and fixing it in place in the shaving brush handle. The quality of a Simpson shaving brush is unsurpassed, and with nearly 100 years of expertise you are guaranteed the best brush to lather up with. No other shaving brush maker manages to achieve the hair density Simpson do, this gives their brushes excellent backbone for lathering. 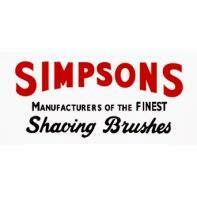 A. E. Simpson was first established in 1919, they are the world's oldest manufacturers of shaving brushes. Each brush is carefully handcrafted to guarantee the highest quality possible.